Android "Oreo" is the eighth major release and the 15th version of the Android mobile operating system. It was first released as an alpha quality developer preview in March 2017 and released to the public on August 21, 2017. As of October 26, 2018[update], 21.5% of Android devices run Oreo, with 14.0% on 8.0 and 7.5% on 8.1. Android Oreo was internally codenamed "Oatmeal Cookie." On March 21, 2017, Google released the first developer preview of Android "O", available for the Nexus 5X, Nexus 6P, Nexus Player, Pixel C, and both Pixel smartphones. The second, considered beta quality, was released May 17, 2017. The third developer preview was released on June 8, 2017 and offered a finalized version of the API. DP3 finalized the release's API to API level 26, changed the camera UI, reverted the Wi-Fi and cellular connectivity levels in the status bar back to Wi-Fi left, added themed notifications, added a battery animation in Settings: Battery, a new icon and darker background for the Clock app, and a teardrop icon shape for apps. On July 24, 2017, a fourth developer preview was released which included the final system behaviors and the latest bug fixes and optimizations. Android "O" was officially released on August 21, 2017 under the name "Oreo". Its lawn statue was unveiled at a promotional event across from Chelsea Market in New York City—a building which formerly housed a Nabisco factory where Oreo cookies were first produced. Factory images were made available for compatible Pixel and Nexus devices later that day. The Sony Xperia XZ1 and Sony Xperia XZ1 Compact were the first devices available with Oreo pre-installed. Android 8.1 was released in December 2017 for Pixel and Nexus devices, which features minor bug fixes and user interface changes. Notifications can be snoozed, and batched into topic-based groups known as "channels". The 'Major Ongoing' feature orders the alerts by priority, pinning the most important application to the top slot. Android Oreo contains integrated support for picture-in-picture modes (supported in the YouTube app for YouTube Premium subscribers). The "Settings" app features a new design, with a white theme and deeper categorization of different settings, while its ringtone, alarm and notification sound settings now contain an option for adding custom sounds to the list. 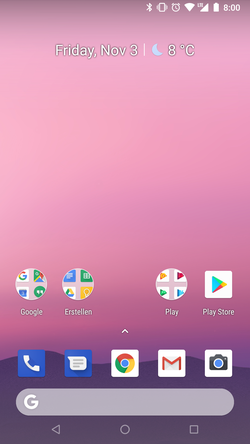 The Android 8.1 update supports the display of battery percentages for connected Bluetooth devices, makes the notification shade slightly translucent, and dims the on-screen navigation keys in order to reduce the possibility of burn-in. Android Oreo adds support for Neighborhood Aware Networking (NAN) for Wi-Fi based on Wi-Fi Aware, Bluetooth 5, wide color gamuts in apps, an API for autofillers, multiprocess and Google Browsing support for WebViews, an API to allow system-level integration for VoIP apps, and launching activities on remote displays. Android Runtime (ART) features performance improvements. Android Oreo contains additional limits on apps' background activities in order to improve battery life. Apps can specify "adaptive icons" for differently-shaped containers specified by themes, such as circles, squares, and squircles. Android Oreo supports new emoji that were included in the Unicode 10 standard. A new emoji font was also introduced, which notably redesigns its face figures to use a traditional circular shape, as opposed to the "blob" design that was introduced on KitKat. The underlying architecture of Android was revised so that low-level, vendor-specific code for supporting a device's hardware can be separated from the Android OS framework using a hardware abstraction layer known as the "vendor interface". Vendor interfaces must be made forward compatible with future versions of Android. This new architecture, called Project Treble, allows the quicker development and deployment of Android updates for devices, as vendors would only need to make the necessary modifications to their bundled software. All devices shipping with Oreo must support a vendor interface, but this feature is optional for devices being updated to Oreo from an earlier version. The "seamless updates" system introduced in Android 7.0 was also modified to download update files directly to the system partition, rather than requiring them to be downloaded to the user partition first. This reduces storage space requirements for system updates. Android Oreo introduces a new automatic repair system known as "Rescue Party"; if the operating system detects that core system components are persistently crashing during startup, it will automatically perform a series of escalating repair steps. If all automatic repair steps are exhausted, the device will reboot into recovery mode and offer to perform a factory reset. The Android 8.1 update also introduces a neural network API, which is designed to "[provide] apps with hardware acceleration for on-device machine learning operations." This API is designed for use with machine learning platforms such as TensorFlow Lite, and specialized co-processors such as the Pixel Visual Core (featured in Google's Pixel 2 smartphones, but dormant until 8.1 is installed), but it also provides a CPU fallback mode. A tailored distribution for low-end devices known as Android Go was unveiled for Oreo; it is intended for devices with 1 GB of RAM or less. This mode has platform optimizations designed to reduce mobile data usage (including enabling Data Saver mode by default), and a special suite of Google Mobile Services designed to be less resource- and bandwidth-intensive. The Google Play Store will also highlight lightweight apps suited for these devices. The operating system's interface is also modified, with the quick settings panel providing greater prominence to information regarding the battery, mobile data limit, and available storage, the recent apps menu using a modified layout and being limited to four apps (in order to reduce RAM consumption), and an API for allowing mobile carriers to implement data tracking and top-ups within the Android settings menu. Google Play Services was also modularized to reduce its memory footprint. Android Go was made available to OEMs for Android 8.1. Android Oreo re-brands automatic scanning of Google Play Store and sideloaded apps as "Google Play Protect", and gives the feature, as well as Find My Device (formerly Android Device Manager) higher prominence in the Security menu of the Settings app. As opposed to a single, system-wide setting for enabling the installation of apps from sources outside of the Google Play Store, this function is now implemented as a permission that can be granted to individual apps (i.e. clients for third-party app repositories such as Amazon Appstore and F-Droid). Verified boot now includes a "Rollback Protection" feature, which enforces a restriction on rolling back the device to a previous version of Android, aimed at preventing a potential thief from bypassing security measures by installing a previous version of the operating system that doesn't have them in place. ^ Burke, Dave (August 21, 2017). "Introducing Android 8.0 Oreo". Android Developers Blog. Google. Retrieved August 28, 2018. ^ "Google Git". Android Source. Google. Retrieved August 3, 2018. ^ "Distribution Dashboards". Android Developers. October 26, 2018. Retrieved October 31, 2018. ^ "Android O May Be Called 'Oatmeal Cookie', Internal Code Reveals". NDTV Gadgets360.com. Retrieved September 26, 2017. ^ a b c Bohn, Dieter (March 21, 2017). "Google releases Android O to developers, promising better battery life and notifications". The Verge. Vox Media. Retrieved March 22, 2017. ^ Lardinois, Frederic (March 21, 2017). "Google launches the first developer preview of Android O". TechCrunch. AOL. Retrieved March 22, 2017. ^ Ruddock, David (March 21, 2017). "Google announces Android O: Focus on power management, notifications, and more". Android Police. Retrieved March 22, 2017. ^ Crider, Michael (March 21, 2017). "Android O Developer Preview Supports Nexus 5X and 6P, Nexus Player, Pixel and Pixel XL, and Pixel C". Android Police. Retrieved March 22, 2017. ^ "What's New in Android: O Developer Preview 2 & More". May 17, 2017. Retrieved May 20, 2017. ^ a b "Android O Developer Preview 3 launches, finalizes APIs". Ars Technica. Retrieved June 10, 2017. ^ Li, Abner (June 8, 2017). "Here's everything new in Android O Developer Preview 3 [Gallery]". 9to5Google. Retrieved June 13, 2017. ^ "Developer Preview 4 now available, official Android O coming soon!". Android Developers Blog. Retrieved July 24, 2017. ^ Li, Abner (August 21, 2017). "Google releases Android 8.0 Oreo factory images for Pixel, Nexus as OTA fails for many [Update: Fixed]". 9to5Google. Retrieved August 22, 2017. ^ "Android O finally has a name: Say hello to Oreo". CNET. Retrieved November 4, 2017. ^ "The Xperia XZ1 is available in the U.S. for $700; Xperia XZ1 Compact coming soon". Digital Trends. September 19, 2017. Retrieved September 20, 2017. ^ a b "Android 8.1 has arrived – here's everything it brings". TechRadar. Retrieved December 18, 2017. ^ a b Zaharov-Reutt, Alex. "Android Oreo 8.1 update released for Google's Pixels and Nexus devices". iTWire. Retrieved December 18, 2017. ^ Gartenberg, Chaim (March 21, 2017). "Android O will give you even more control over notifications". The Verge. Vox Media. Retrieved March 22, 2017. ^ Davenport, Corbin (March 21, 2017). "Android O feature spotlight: Notification Channels give more controls over notifications to users". Android Police. Retrieved March 22, 2017. ^ "Android Oreo review: it's what's inside that counts". The Verge. Retrieved June 27, 2018. ^ "Eight Android Oreo Features You Need to Definitely Check Out". NDTV Gadgets360.com. Retrieved August 29, 2017. ^ "YouTube's Picture-in-Picture mode in Oreo is only available to paying Red customers in five countries, and that's a problem". Android Police. August 29, 2017. Retrieved August 29, 2017. ^ Garun, Natt (March 21, 2017). "Android O brings picture-in-picture support so you can watch YouTube while hailing a Lyft". The Verge. Vox Media. Retrieved March 22, 2017. ^ Whitwam, Ryan (March 21, 2017). "Android O feature spotlight: Picture-in-picture video for all devices and new windowing features". Android Police. Retrieved March 22, 2017. ^ Amadeo, Ron (March 23, 2017). "Hands-on with Android O—A million new settings and an awesome snooze feature". Ars Technica. Condé Nast. Retrieved April 14, 2017. ^ El Khoury, Rita (March 23, 2017). "Android O feature spotlight: Easily add custom ringtones, alarm sounds, and notification sounds". Android Police. Retrieved March 24, 2017. ^ Statt, Nick (March 23, 2017). "Android O will make it easier to add custom ringtones and notification sounds". The Verge. Vox Media. Retrieved March 24, 2017. ^ Whitwam, Ryan (March 21, 2017). "Android O feature spotlight: Neighborhood Aware Networking (NAN) mode for WiFi". Android Police. Retrieved March 22, 2017. ^ a b c d "Android 8.0 Oreo, thoroughly reviewed". Ars Technica. Retrieved September 14, 2017. ^ Ruddock, David (March 21, 2017). "Android O feature spotlight: Android will support wide color gamut profiles in apps". Android Police. Retrieved March 22, 2017. ^ Carman, Ashley (March 21, 2017). "Android Oreo will limit what apps can do in the background to save battery life". The Verge. Vox Media. Retrieved March 22, 2017. ^ Crider, Michael (March 21, 2017). "Android O Feature Spotlight: Adaptive icons give devs and OEMs easy shape masks, extra effects". Android Police. Retrieved March 21, 2017. ^ "Google redesigns emoji (again) for Android O". GSMArena. Retrieved May 19, 2017. ^ "Google I/O 2017: Android O to Bring Redesigned Emojis, Full Support for Emoji 5.0 Characters". NDTV. Retrieved May 19, 2017. ^ "Project Treble – Can Android Fix Their Update Problem Now?". Bettershark. ^ "Google's "Project Treble" solves one of Android's many update roadblocks". Ars Technica. Retrieved May 12, 2017. ^ Malchev, Iliyan (May 12, 2017). "Here comes Treble: A modular base for Android". Android Developers Blog. Retrieved July 18, 2018. ^ "OnePlus won't support Android Oreo's quick OS updates feature". The Verge. Retrieved November 26, 2017. ^ "Android 8.0's "streaming OS updates" will work even if your phone is full". Ars Technica. Retrieved August 7, 2017. ^ "Rescue Party". Android Developers. Retrieved September 14, 2017. ^ "This New Android Oreo Feature Helps Rectify Bootloop Issues". NDTV Gadgets360. Retrieved September 14, 2017. ^ a b "Android 8.1 Oreo goes final, rolling out now to Pixel and Nexus devices". Ars Technica. Retrieved January 4, 2018. ^ "Google launches the Android 8.1 Developer Preview". Ars Technica. Retrieved January 4, 2018. ^ ""Android Go" will strip Android down for ultra-low-budget phones". Ars Technica. Conde Nast. Retrieved May 19, 2017. ^ "Android Go could help make Android O a runaway success". Engadget. Retrieved May 19, 2017. ^ "Android Oreo feature spotlight: Rollback Protection, a new part of Verified Boot, won't allow you to start a downgraded OS". Android Police. September 5, 2017. Retrieved September 7, 2017.